Phu Quoc (Vietnam) – January 24, 2019 (travelindex) – Best Western Hotels & Resorts has celebrated the opening of a brand new upscale resort on the golden coast of Phu Quoc, Vietnam’s beautiful “Pearl Island.” Best Western Premier Sonasea Phu Quoc is a world-class beachfront resort nestled on the island’s west coast, just 8km from Phu Quoc International Airport. It officially opened its doors on January 20th, 2019, with a ceremony attended by senior executives from Best Western Hotels & Resorts, hotel owners and developers, and Phu Quoc Investment & Development JSC and CEO Group. This landmark destination features 566 keys, including stylish rooms, sumptuous suites and a series of stunning villas nestled alongside a spectacular 300-meter-long lagoon pool. Room sizes range from the spacious 35 square meter Deluxe Rooms to the luxurious 245 square meter Presidential Villa, and guests staying in the suites and villas will have access to an Executive Lounge. Guests have multiple dining options at Best Western Premier Sonasea Phu Quoc, The Essence Restaurant serves exquisite Vietnamese and international cuisine for breakfast, lunch or dinner, while the Oasis Pool Bar is a great place to chill out during the day, with cool drinks and a Mediterranean-inspired à la carte menu. C View Sky Bar, the chic rooftop bar and restaurant, is a perfect spot for sunset cocktails with panoramic sea views. Tropical pools, landscaped gardens and palm-lined paths flow all the way down to the beach – a 130-meter-long stretch of pristine sand, lapped by warm clear seas. Adventurous guests can take part in paddle-boarding, kayaking and body-boarding, while the resort’s Thala Spa is a luxurious haven of tranquility for those looking to unwind. A fully-equipped fitness center is also available, and young guests will be kept fully entertained at Nemo’s, the resort’s kids’ club. 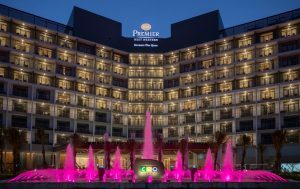 Best Western Premier Sonasea Phu Quoc is more than just a leisure retreat,with its flexible meeting space, business facilities and highly accessible location, the hotel is also the ideal setting for tropical corporate retreats, team-building weekends and destination weddings. “It is an honor to be here with Phu Quoc Investment & Development JSC and the CEO Group to present this exceptional new hotel to the world,” Olivier Berrivin, Best Western Hotels & Resorts’ Managing Director of International Operations – Asia, told attendees at the opening ceremony. “At Best Western, we are always seeking strong and professional partners to work with, and CEO Group has shown its skill and vision by creating Best Western Premier Sonasea Phu Quoc. I have no doubt that this remarkable new resort will delight our guests and enhance the entire destination. “With international visitor arrivals to Vietnam reaching record levels, the country is in need of high-quality branded accommodation with extensive facilities for business and leisure travelers. As one of the world’s largest and most renowned hotel groups, Best Western Hotels & Resorts is perfectly placed to contribute to the expansion of Vietnam’s tourism industry,” Olivier added. The opening of Best Western Premier Sonasea Phu Quoc represents an important phase of Best Western’s Asian expansion strategy. The company has identified Vietnam as one of its key target markets, due to the country’s buoyant economy, surging visitor numbers and tourism-friendly government policies. In recent months, Best Western has signed a series of impressive new hotel projects in Cam Ranh, Ha Long, Vung Tau and Quang Binh, most of which feature more than 500 keys. In the future, Best Western will continue to seek opportunities to bring its timeless values of world-class hospitality and unsurpassed service to even more parts of Vietnam, further enhancing the country’s thriving tourism industry. Best Western Hotels & Resorts headquartered in Phoenix, Arizona, is a privately held hotel brand with a global network of over 4,200 hotels in nearly 100 countries and territories worldwide*. Best Western offers 13 hotel brands to suit the needs of developers and guests in every market: Best Western®, Best Western Plus®, Best Western Premier®, Vīb®, GLō®, Executive Residency by Best Western®, Sadie HotelSM, Aiden HotelSM, BW Premier Collection® by Best Western, and BW Signature Collection® by Best Western, as well as its recently launched franchise offerings: SureStay® Hotel by Best Western, SureStay Plus® Hotel by Best Western and SureStay Collection® by Best Western**. Now celebrating more than 70 years of hospitality, Best Western provides its hoteliers with global operational, sales and marketing support, and award-winning online and mobile booking capabilities. Best Western continues to set industry records regarding awards and accolades, including 66 percent of the brand’s North American hotels earning a TripAdvisor® Certificate of Excellence award in 2018, Business Travel News® ranking Best Western Plus and Best Western number one in upper-mid-price and mid-price hotel brands respectively for two consecutive years, and Fast Company honoring Best Western Hotels & Resorts with a spot in the Top 10 Most Innovative Companies in the Augmented Reality/Virtual Reality category. Best Western has also won 10 consecutive AAA®/CAA® Lodging Partner of the Year awards, recognizing the brand’s commitment to providing exceptional service and great value to AAA/CAA’s nearly 60 million members in the U.S. and Canada. Best Western-branded hotels were top ranked in breakfast (food and beverage category) by J.D. Power’s 2018 North America Hotel Guest Satisfaction Index Study – ranking first for midscale; and second for upper midscale. Over 37 million travelers are members of the brand’s award-winning loyalty program Best Western Rewards®, one of the few programs in which members earn points that never expire and can be redeemed at any Best Western-branded hotel worldwide. Best Western’s partnerships with AAA/CAA and Google® Street View provide travelers with exciting ways to interact with the brand. Through its partnership with Google Street View, Best Western is the first major company of its size and scale to launch a virtual reality experience for customers, setting a new industry standard and reinventing how guests view hotels. **All Best Western and SureStay branded hotels are independently owned and operated.